Publish date: 26. October 2018. 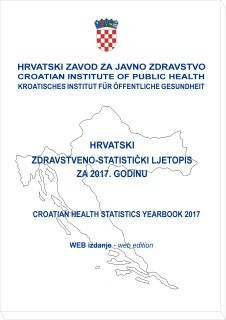 Croatian Health Statistics Yearbook contains the most important data and indicators concerning the work of health services within the health care system, as well as health condition indicators for the Croatian population and selected population groups. All data is collected from health facilities and practices throughout Croatia, regardless of the type of ownership of the institution or health insurance of an individual. Health indicators not only point to actual condition, but also enable monitoring of the trends of given indicators. They are indispensable for the evaluation of the work and efficiency of the health care system, and serve as the grounds for health care planning at national and local levels. The work on development and quality of health indicators in the overall hospital and outpatient health activity is conducted in close cooperation with regional institutes of public health.